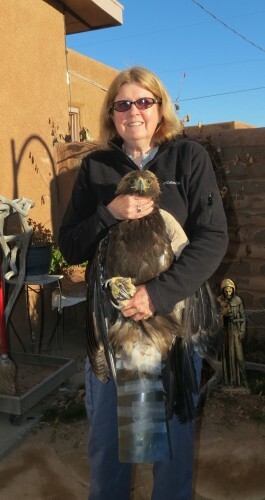 “We Found a Hawk” /Hawks Aloft Inc.
Just last week, we received a call from Craig Sizemore at Central New Mexico Electric Cooperative about a ‘hawk’ they had rescued in Estancia. Julia Davis raced out to meet them in Edgewood and returned with, not a hawk, but a Golden Eagle! And, it was stuffed like a sausage into a very small box. One look at the tail tip, and it was clear that this was NO hawk. Gail held the bird while Lisa did the exam. 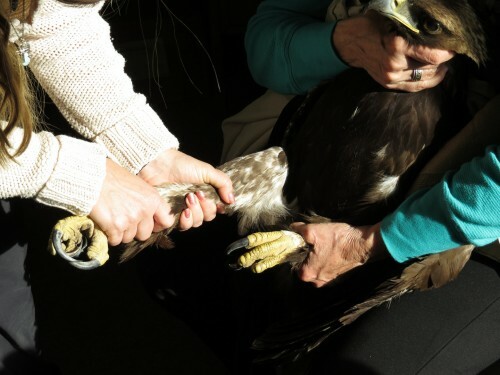 She began by looking at the obviously injured left wing, where the ‘hand’ area of the bird was clearly injured, but no fractures were evident. Lisa applied an antibiotic ointment to the injured area and wrapped up the wing to prevent further damage. 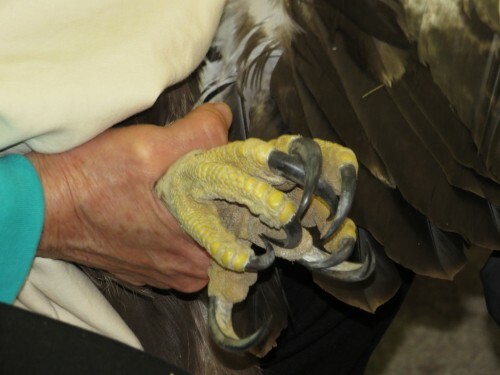 She still had to examine the rest of the eagle, who was patient beyond belief while Lisa poked and prodded looking for another hidden problem. Each of the legs had to be extended to ensure that no hidden problem lurked there. Check out the size of these feet! It is clear why this is a two person operation. We were extremely thankful that this big bird was so cooperative, and struggled little. The image above gives a good comparison of the size of a Golden Eagle relative to an average-sized woman. Exam over, we began looking for an appropriate sized box into which to place the eagle to transport it to Lisa’s facility. Not a single eagle-sized box was to be had at our office, or any of the other offices in our business park! What’s up with that? So, it was a three person job to move the eagle to Lisa’s facility. We covered his head with a towel, and Lisa belted in Gail and the Eagle in the front passenger seat, while Julia Davis followed behind with Gail’s car. It was not your average day at the Hawks Aloft office. 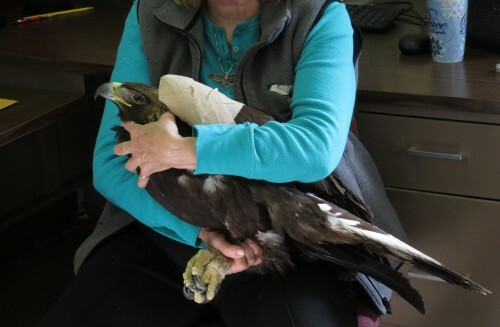 The following morning, it again took two people to medicate the bird and get it to the vet, then onward to The Wildlife Center in Espanola where the eagle is recuperating. We hope that this juvenile will be releasable. While rescues like these are heartwarming, and we gain so much from working with these birds, the staff time necessary to care for each bird is completely unfunded except for member donations. 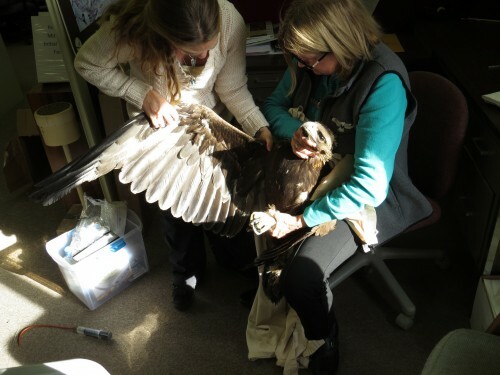 We thank Craig and his colleagues for rescuing this young Golden Eagle, and for following up to check on his progress. As we were sending off the young eagle, we took the opportunity to snap a couple of photos. What a beautiful creature – so glad youall were there to take care of it. So huge, and just a juvenile! Thanks Jill! I was an honor to work with that bird. What a fantastic bird and what an honor to be able to hold and help him/her 🙂 And then to have the bird at home over night. How exciting! Suppose not much sleep to be had that night though. Way to go sister and Gail! Bird if half the size of Lisa, but she’s not so big herself! I hope he/she will be ok; definitely in good hands. Ditto to the earlier comments. It’s a special opportunity to hold such a bird and for it to accept your help. Thanks to all at HawksAloft. It was indeed a privilege to work with that bird. I was trying to avoid being bitten in a sensitive area. Actually I wasn’t holding to tight, but all those feathers made it look like I was strangling the bird.